EXTRAVAGANZA is a 4-week ensemble theater arts program for kids who want to play full time, from 9:00 am – 3:00 pm, Monday through Friday, in July. Students ages 10 – 18 work with professional theater artists to learn performance skills and stagecraft from every angle—from climbing a ladder to paint scenery, to running the light board, designing posters, and stitching the king’s pantaloons on the sewing machine. Everyone gets into the act. 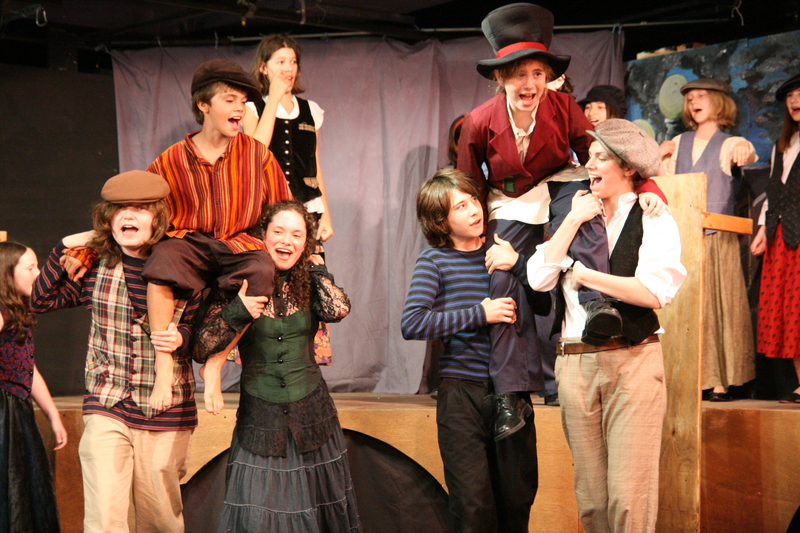 Because children remember the plays of their youth all their lives, we specialize in classics of farce and adventure by such masters as Lewis Carroll, Chaucer, Moliere, Isaac Bashevis Singer, Gogol, Shakespeare, Gilbert and Sullivan, and George and Ira Gershwin, as well as multi-cultural folklore. Productions are steeped in music and dance, and resonate with beautiful language, with just a dash of Marx Brothers. Extravaganza, was founded by Catharine Baldwin in 1990 at The Hudson School, and has been a cultural tradition in Hoboken for 25 years. It was inspired by Harlequin Players, a summer stock theater company created by Tony Vintcent and Janet Spencer Shaw in Dallas, Texas in the 1960’s.